Warriors Arena Architect Calls "Toilet" Comparison "Silly," "Unfortunate" and "Disappointing"
An architectural drawing presented on Sept. 22, 2014 in San Francisco showing the northeast corner of the future Warriors Arena. The potty jokes flowed in from around the country. 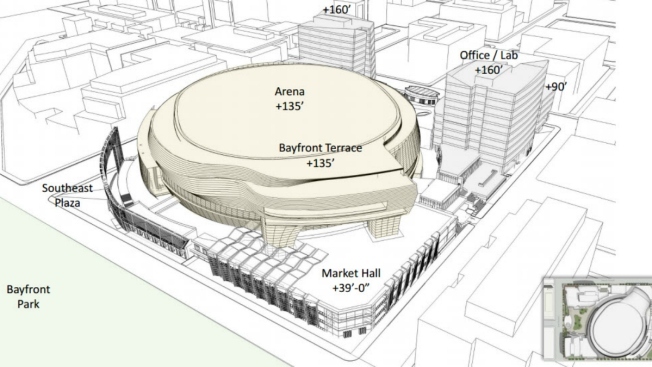 The national media couldn't get enough on Tuesday of how the new Golden State Warriors architectural drawings seemed to resemble the top of a toilet lid, and perhaps, should be flushed down the drain. NBC Sports, The Washington Post,DeadSpin, Sports Illustrated, and USA Today all chimed in. But no one bothered to ask the architect under fire whether he intended the Warriors' future home to look like a loo. In an exclusive interview with NBC Bay Area, lead Warriors arena architect David Manica said he certainly did not. "Unfortunately, people focused on the silly comments about the toilet," he said in a phone interview on Wednesday . "I'm not angry. Just disappointed. But I'm not too worried about it. When it's done, that's the last thing people will be thinking about." "Operation Purple Haze": 20 Arrested in SoCal Crackdown on "Sizzurp"
The public just seemed to be enjoying the bathroom humor: "No one ever called me," he said. The first draft of plans for the 18,000-seat arena with half a million square feet of office space, nearly 100,000 square feet of retail, and acres of open space were unveiled Tuesday at a public community meeting in San Francisco. Real estate blog Socketsite first posted the drawings online and the comments – and the toilet analogies – started to pour in. So did the headlines. But the design element that critics pounced on, Manica said, is a 10,000-square-foot ballroom floating above the San Francisco Bay that the architect is sure won't at all resemble a toilet when construction is complete. This element is new, he said, and wasn't included in previous designs, when the Warriors were supposed to be at Pier 30-21 south of the Bay Bridge along the Embarcadero. That plan was scrapped for thenew location at Mission Bay, south of AT&T Park, near a new UCSF Benioff Children's Hospital For now, the Warriors play in Oakland at the o.Co Coliseum. "It's going to be wholly spectacular," Manica said. That said, he added that there is still a year more of "intense designs" to be hashed out, and there is a "long road ahead" in terms of changes and edits to the original, early sketches. Manica's intentions were to evoke a yachting, nautical theme along the waterfront edge, and adhere to his client's "sophisticated aspirations." The arena, he hopes, will have a "blurred" elliptical shape, somewhere between a rectangle and circle. The space, he hopes, will also feature an open-air market, where vendors and local artists can sell their wares, or a place for the public to come and ice skate in the winter and buy pumpkins at Halloween. Conceptual drawings of Golden State Warriors Arena present in San Francisco on Sept. 22, 2014. The Kansas City-based Manica isn't too focused on the toilet comments anyway. He's too busy designing other sports arenas around the globe, including the VTB Arena Park under construction in Moscow, which features a dual space for both hockey and football, along with a retail mall. 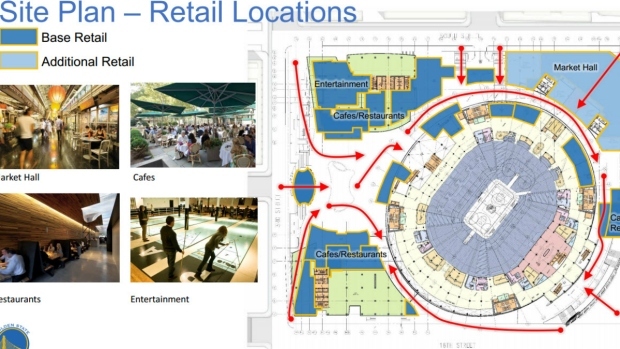 The Warriors arena will be privately financed, and construction is expected to begin in late 2015. The team hopes the arena will be ready in time for the 2018-19 NBA season. 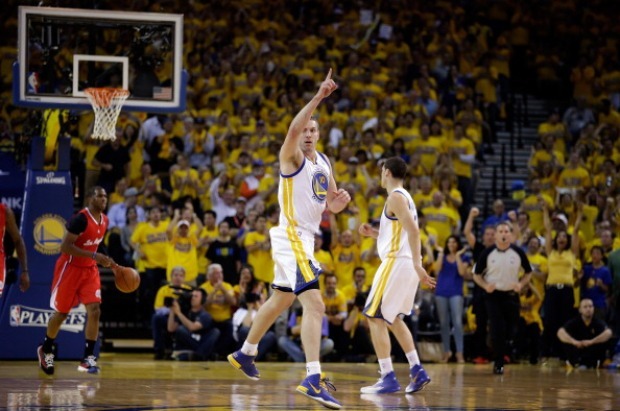 Warriors spokesman PJ Johnston said the team has not announced the price tag to build the new center.